Easter eggs are in-jokes and references to other films, games, etc. 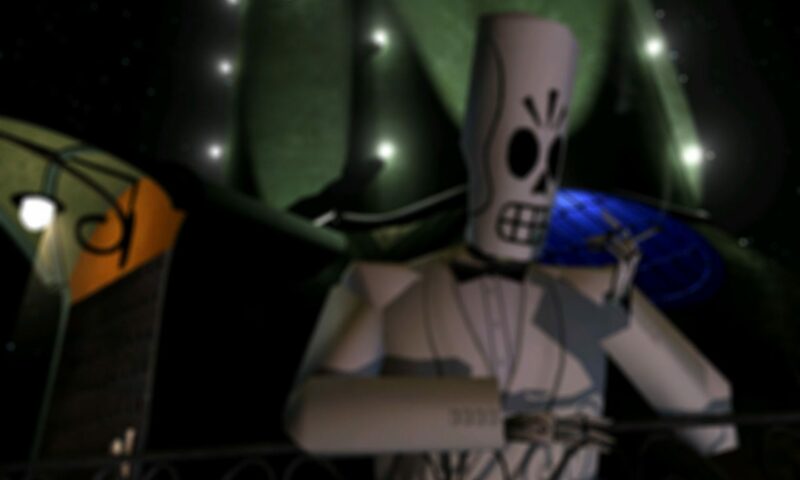 Grim Fandango has quite a number of these, and in fact most of the game’s characters have names with a deeper meaning — see the ‘behind the scenes’ section on each character’s page for more about that. More broadly though, below are some of the things throughout the game that you might have missed. The Bone Wagon is based upon the unique hot rods that Ed ‘Big Daddy’ Roth spent much of his life bringing to life through both artistic renditions and constructed vehicles. The design for Glottis was likely inspired by Roth’s hot rod-driving character, Rat Fink. In Toto’s Scrimshaw Parlor, there’s a sheet of tattoos stuck to the wall next to the phone that are based on the Corley Motors logo from Full Throttle and the lead characters from Sam & Max. Bring your sharpest eyes when trying to spot them. ‘Cabron’ – this is what Manny calls Domino at the Edge of The world. Literally, it means ‘billy-goat’. But in Mexico, it is an extremely strong expletive. An insult of the highest magnitude. When crossing the bridge in Rubacava, the bombastic musical sting is based on the main theme from Secret Weapons of the Luftwaffe, a World War 2 flight simulation game that LucasArts released in 1992. What hint are you referring to? Also, you are spoiling the story yourself with your comment so I’ve edited that part out — sorry.